Last week, while squidding at Brighton Marina, I bumped into local fishing guide, Rob ‘Fishyrob’ Howard who asked if I was up for a crack at some shore caught turbot. Always up for any fishing session, I obviously jumped at the chance. In the next few days, plans were formulated to head ‘Down West’, leaving in the early hours of Monday morning and fish throughout the day. 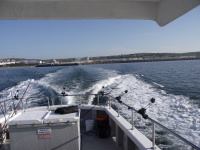 Anyway, on the Sunday, Rob rang me to ask if I fancied a change in plans, as a chance had come up to fish aboard Brighton based charter boat ‘Grey Viking II‘, an Aquastar 38′ Pro Fisherman, skippered by Ray Burn. We both agreed, that as the beach we were going to fish would be rammed with people taking advantage of the current glorious weather, the change in plans could be more productive. It wasn’t to be a full proper charter but a prospecting session, researching for some good turbot/brill/ray ground. The obvious advantage to this was that there would only be the three of us aboard, thus maximising the available space. Shortly after 7am yesterday, saw me arrive at Fishyrob HQ for a quick coffee, before heading off down to the marina. Even then, Rob couldn’t resist a quick, ten minute go for some squid on the east arm. It was then off to meet Ray and wolf down a hearty breakfast at the West Quay, a Wetherspoons pub. All stuffed and ready to go, gear and bait was stowed aboard and soon we were off out of the marina, heading to the first mark for some extensive surveying and mapping of the sea-bed. Once done, baits were dropped down and we started the first drift with anticipation of a large large ‘flattie’ engulfing our mackerel fillet or launce that were trundling along the bottom. A few drifts later and with no fish to show for it, we headed off to the next mark, where we drifted along the edges of a submerged wreck. No ‘Flatties, but I did manage two large pout that had taken a fancy to my large launce fillet baits. It was soon time for a move and we headed off to try another area. This didn’t prove to be fruitful either, with none of us hitting any fish. If nothing else though, the weather was fantastic, lovely warm, bright sunshine and with not a breath of wind across the flat mill pond like sea. We shot off to another likely mark that had produced before – but sadly on this occasion, it was blankety blank time. We were wishing now, that we had packed some bait to have a go at the plaice but then we agreed, we would have stuck with that and not done what we were supposed to be doing, which was researching and looking for specific turbot marks. By early afternoon, a sea breeze had picked up and things turned a bit chilly, even with the still bright sun – I even had to resort to putting my ‘fishy’ jacket on in an effort to keep the breeze out. Ray decided that if nothing showed on the next few drifts we should call it a day and head back in. 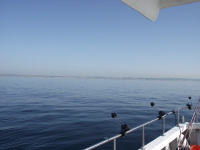 As it happens, nothing happened and we remained fishless, so headed off back to port. Rob and I were going to have a squiddy session at the marina when we got back – but as it happened, we got sidetracked and ended up having a beer at the pub instead. We thought we might still have a shot at them but in the end, with my back screaming, I bottled it and headed off home. Even though we didn’t manage to bag our target, the leg work had been done in getting most of the info Ray needed for future shots at the turbot and brill. It was a still a great day out and I can’t wait to book up for a full charter wrecking trip aboard this great boat with a top skipper. Thanks to Ray and Rob for a great day out.